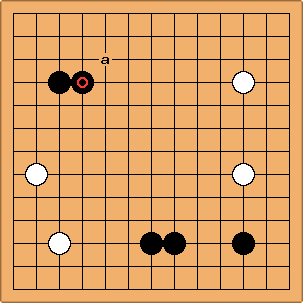 I (anonymous) have just started playing Go for about a couple months and one of the mistakes I was making early on and didn't find out till later was I was playing too thick. After making the correction I noticed that almost all beginners were doing this so I thought I would post about it here. 20+k loser: Agreed, Bill, my problem is that I play too loose, nearly throwing the stones down and hoping they land somewhere nice. Alex Weldon: So perhaps the page title is correct, and only the content is wrong. ;-) Maybe the biggest problem for beginners is telling the difference between thickness and overconcentration. Bob McGuigan: I think thickness is a difficult topic for players at any level. I recall that Kobayashi Koichi used to be criticized for making moves which top pro commentators thought were slow but which Kobayashi thought were thick. The reason for this is simple: beginners read that they should stay connected and that thickness means strength and influence. Which of course sounds great. So they start out in the corners like they were told maybe, or even at the edges too. But after that they just link stones right up next to each other building their walls right away. They're afraid to spread out because they've learned that separated stones are easily attacked and captured. And who doesn't want strength? One of the first things I learned as a beginner was if I wanted to have any territory I would have to play looser and take chances. Another Go player also mentioned to me that what I was referring to was overconcentration. Oh well thanks for correcting me. I will leave it as it is for now, unless someone else wants to take the time to go and change all the words "thick" to "over-concentration". Thanks for fixing my page Bill or whoever it was. (Whoever I am) I knew it didn't look right. Kris Rhodes: Would this be better referred to as playing "too heavy"? Or is that something else? | kb: I have to disagree with you here, Bill. Being heavy doesn't imply that there are too many stones in one area, it just implies that they're not very flexible or that they're a burden. Overconcentration just means that strength is overlapping, usually because there are too many strong stones in one area. I'd find it very hard to call an invading group my opponent made heavy overconcentrated, especially if the invasion region is the right direction of play. Heavy, light, thick, thin, and overconcentrated are very hard words to define and differentiate (on paper)! argybarg: Couldn't we also say that these moves are small? The real fault here might be in mis-measuring the value of moves against the opportunity in the whole board. This is something that beginners (understandably) struggle with. Karl Knechtel: Disturbingly, I see these mistakes, or similar ones, from players at my ("kyu-counted-on-one-hand") level too. Well, the first two anyway. Andy Pierce: I think this is part of falling in love with your stones. If you try to save every stone you put on the board you wind up either overconcentrated or, even worse, heavy. Mentally, beginners justify this kind of play as thick when it's not. Remember that thickness needs to be useful, where useful does not simply mean "doesn't get killed". Make your stones work for you. This includes working to force your opponent to kill them so that your other stones can benefit even more. My $0.02 anyway. unkx80: A teacher told me many years ago used this example. He said that the Black group is extremely thick and can never be attacked at all, but Black has only two points for all this thickness. Dieter: Clearly in the teachers' world there is no consensus. My teacher Minue, when asked if a group's thickness means strength of group said it doesn't, and when consequently asked if it involved influence said it did, but there was more to it. Then he also told me it is definitely not the same as solid and went on to show examples of thickness which we all know, such as full triangles with extra legs, or mouth shapes, facing the centre. I gave up some time ago to fully understand what oriental players and teachers (please don't take this badly) mean when they use the term. For my own conceptual understanding of the game I suffice with locally strong groups (an attempt to cover atsumi), global lack of defects (an attempt to cover atsusa) and plays leading to them, and influence. Which is also why I avoid using the term thick(ness) in any of my current writings or game reviews. unkx80: No problems. =) I don't think I really understood these terms myself too, at least not in the English speaking world.